On the eastern parts of Mon the underlying limestone is pressed up by the glaciers during the Last Ice Age. At the coast up to 100 m high limestone cliffs can be seen. 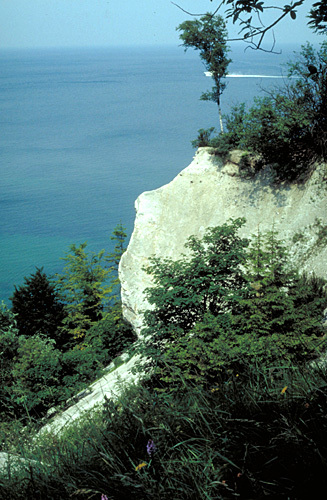 The cliffs of Mon ("Møns Klint") together with surrounding areas are now protected and a part of the Natura2000 network At south lies a limestone hill called Høvdblege which also is protected. The cliffs of Mon are a mosaic between forest mainly of beech and open areas in different stages of regrowth. Occasionally large parts of the limestone cliffs are sliding in to the sea leaving open areas with fens and small streams. In several places lie open, dry grassland which have been grazed in centuries - the largest is Jydelejet - a large valley running down against the coast. The limestone in the ground and the very varied landscape and soil has resulted in a flora that is unique in Denmark. In this southeastern part of Denmark and due to the surrounding Baltic Sea, the climate is quite warm. Several rare species of animals preferring the warm climate can be found here - most known is The Large Bue Butterfly - Maculinea arion. It is a very rare and protected species all over Europe. It has a very interesting biology as it is totally depended of a certain species of ant, which collects the catterpillars and feeds them in their nests. On the steepest cliffs another rare species can be seen as the peregrine falcon here has its only breeding site in Denmark.